Mr. G is too busy to use the internet, so I'm still here. Item, the first :: CBS Sunday Morning has moved the segment on Mr. G from this Sunday, November 1 to (tentatively) Sunday, November 8. More as it develops. Item, the second :: Thanks to reader Tony McFee and Audible.com's director of direct marketing, we have the NYC subway ad! Between the hours of 11pm on Friday October 30th and 11pm Sunday November 1st, 15 bookstores will be hosting Graveyard Book Halloween parties. Mr. G would like to visit as many as he can in these four hours. Assume you can model these bookstores as a connected graph G(V,E) where each vertex v corresponds to a bookstore. Positive edge weights w(u,v) denote the time (in minutes) it takes to travel between bookstores u and v.
a. Give an algorithm to calculate the maximum number of bookstores Mr. G can visit in four hours by traveling along the edges of this graph. b. Give the run time of this algorithm. c. Assume each bookstore also has a weight B(v) which tells you how long you can stay at that bookstore. Mr. G does not want to play favorites so on a given path p of n bookstores, he will stay k minutes at each bookstore where k = min(B(v1),B(v2),...,B(vn)). Given this constraint, give an algorithm to determine how many bookstores Mr. G can visit in four hours. If anyone manages to provide a suitable answer set, they shall have an imaginary cookie. I just wanted to say thanks for the link to BDFAR in Durham! I've lived in the area my whole life, but somehow how I had never heard of it. I am G-mapping directions there as we speak and now have a fruitful occupation for my afternoon. 2.) You're welcome! I hope you liked it. I picked up some incredible used books there over the years, as well as the comics and music. This is Eben, my spirit animal. Apropos of nothing, except that Mr. G has been known to mention his Android phones, I'm playing with the Motorola CLIQ this evening. It's fun and cute, but I don't think I'll be trading my (deliciously modified, optimized) G1 in for anything short of a significant upgrade in processor and RAM. National Novel Writing Month begins Sunday. I've been participating successfully since 2005, and recommend doing it at least once if you have any sort of writerly ambition. It's a good deal of fun, and completely mad. I've received several queries about where else I may be found online. I'm willing to go as far as re-stating that I have a largely neglected livejournal. We're up to 35 independent book stores throwing Graveyard Book parties. Dark Horse has posted a preview of Drawing Down the Moon: The Art of Charles Vess. Livejournal syndicated feeds are borked up; it's not just us. For the record, I do not read Mr. G's email when he is gone, not even the FAQ line stuff. I only see things submitted via the Site Inquiry line. Mr. G is tweeting quite a bit again, so I expect this will be my final post for this outing. I remain, as always, your faithful web goblin. 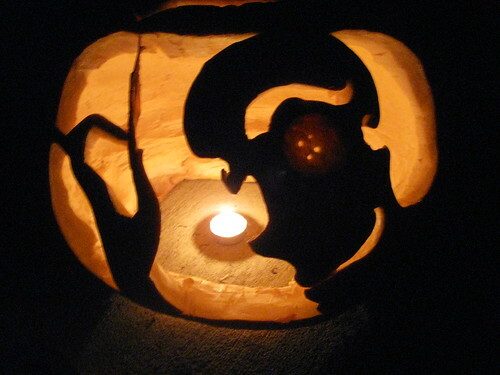 If you have your own carved pumpkin inspired by one of Mr. G's works, I'd love to see it. All of my attempts at writing a new post had been in vain. With ice in my heart, I stared at the blank text input field, then tabbed back to my inbox. Still empty. When was Mr. G going to send me something else to post? Would I ever learn what he was up to in China? Would I live long enough for that? Somewhere, far, far away in the cold mountains of Chendgu, a panda sniffled. A Dream and My Cardigan: Thematic Similarities between Neil Gaiman's The Goldfish Pool and Other Stories and Miley Cyrus' Party in the U.S.A.
ABSTRACT: Speculative fiction and tween music are both ripe with stories of alienated characters attempting to find their way through unfamiliar, often bizarre environments, be it high school or the submerged city of R'lyeh. Sometimes, the two genres may intersect, such as with Gaiman's The Goldfish Pool and Other Stories and Cyrus' Party in the U.S.A., both about a lone protagonist's arrival in Hollywood, and subsequent descent into madness. EXCERPT: ...cardigan, calling to mind Bjork's mad, transgressive act of eating her own cardigan in response to her treatment at the hands of director Lars von Trier on the set of "Dancer in the Dark". When Ms. Cyrus sings, "Noddin' my head like yea / Movin' my hips like yea", she is describing her own ritualized expression of otherness, dancing in her own dark, so to speak, submerging in the dim "womb dentata" of a club full of stilettos. I am not the knavish sprite I once was; it now takes me more like eighty minutes to put a girdle 'round the Earth, and twice that to get one around myself. I don't, in fact, have a secret network of subway-photographing New Yorkers. Unless by "photographing" you mean "dwelling". I haven't a question, more a spot of praise for Dreamhaven Books that I'd like to share with you, if I might be so bold. Some time ago, Neil told us that Dreamhaven had a new batch of signed stock. I was looking for a special gift for my honorary neiece and so ordered a signed copy of Blueberry Girl, feeling slightly apprehensive about having it shipped to the UK. But, it arrived wonderfully packaged, very quickly and for a modest shipping fee. Thank you Dreamhaven. Three cheers for Dreamhaven Books! It has bought, sold, and even published a lot of awesome stuff over the years. In the spirit of this, the Graveyard Book Parties contest, and Tor.com's serialization of Cory Doctorow's Makers (for which he has requested that readers share some of their favorite booksellers or bookstores with the rest of the community in the comments sections after each post ), please allow me to wax nostalgic about one of my favorite ones. My local independent book store, growing up, was Books Do Furnish A Room in Durham, NC. From third grade through college I was there at least once a week. When I was little, buying Batman and X-Men comics, I had no idea that the store owners had great taste. By the time I discovered what I'd been missing, the Miracleman TPBs and the Dave McKean art books were gone, but I did manage to snag "Angels & Visitations", "Warning: Contains Language", "Violent Cases" (numbered and signed by Mr. G and McKean! ), the whole run of From Hell, several Sandman shirts and posters, and "Signal to Noise". How did you first get into Neil Gaiman's work? That's a good question. I hadn't actually thought about it in, well, possibly, ever, so the answer surprised me. My first exposure to the idea that there was a "Neil" was when I bought a used CD of Tori Amos' "Under the Pink" for $9 at Books Do Furnish A Room. I loved it; later, I got online and found out what "hanging out with the Dream King" and "Neil says hi by the way" meant. The next time I was in BDFAR, I picked up the Sandman "Dream Country" TPB, because it was the shortest and least expensive. It hooked me completely, especially the Midsummer Night's Dream story with Vess. I picked up the earlier Sandman trades, started getting the monthly issue, and then got into his short fiction and other comics work. The rest is history, long-boxes, and continually upgraded bookshelves. Are you enjoying your time updating Neil's blog? Yes. I wasn't sure at first; I was feeling decidedly unwitty and unworthy this time 'round, convinced that Non-Birding Bill would be doing a much better job. In the past few days, though, I've received many nice notes, so I guess my meager attempts are not all rubbish. I hadn't planned on doing any guest blogging at all. Mr. G isn't going to be gone all that long. I'm only posting because he keeps sending me little things he wants posted. I think he's kindly humouring me. "goblin ears knit cap" ??? photographic evidence please. thank you. I should love to see a picture posted of you wearing your goblin ears knit cap. I just knew, when I wrote that, that I was going to get a "pics or it didn't happen!" in response. And here it is. Somewhere, in one of my previous posts from last year, I mentioned that the Web Elf and I had made grand plans for on-site bios of ourselves, complete with pictures in which we would be masked, or otherwise facially obscured, and wearing ears. I was going to commission a knit goblin ears cap from etsy or someplace. Alas, it did not come to pass. The Graveyard Book Halloween parties map is up to 33 independent book stores! Dave McKean is working on an animated film adaptation of "Cages"! Time is running out for those wishing to take advantage of neverwear.net's sale on the otherworldly How to Talk to Girls at Parties print by Camilla d'Errico. Mr. G sent the below image and directed me to find someone in New York that could get me a clean, complete photo of one of these subway ads. I wasn't sure if he meant me to post the request here, or if he thinks that I have a secret network of subway-photographing New Yorkers. Which I do, of course. They're just... uh... busy with other assignments. So, my own efforts having come to naught, I turn to you. If anyone can take a clean, clear, complete photo of this ad for me, Mr. G and I would be appreciative. There are currently twenty-seven independent book stores plotted on the Graveyard Book Halloween Parties map, and that number is still slowly growing. Check back periodically to find one near you, and then please go and support independent book sellers! The Super Assistants Team-Up of Fabulous Lorraine and Beth have been saving cats. If you would like to help, you should follow them on Twitter (@fabulouslorrain / @bethofalltrades) and await the next SOS. 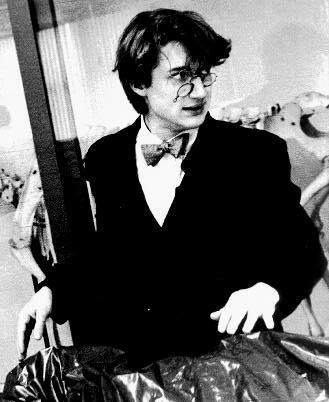 I'd happily go to the mailbag at this point, in hopes of prolonging my blogging stay by playing "Mr. Answer Goblin", but no one has written me recently. I think that readers of The Graveyard Book who perform their own version of the macabray will always be right. And should put video footage of themselves performing it be put up, I will try to link to it. And lo, someone has done just that. A brief update concerning Neil's talk, "Neil Gaiman on Graphic Novels and Fantasy", at the Singapore Writers Festival. Due to the overwhelming response for Neil Gaiman tickets, we have now moved his talk “Neil Gaiman on Graphic Novels and Fantasy” from Chamber, The Arts House to Victoria Theatre. The date and time of the event are the same – Sunday 1 November, 2pm. Victoria Theatre is located next to Victoria Concert Hall, just across the road from The Arts House. The festival will still honour tickets that were previously given out for the event. Additional tickets for this event will be available for collection from The Arts House on Saturday, 17th October from 3pm onwards. Tickets will be limited to ONE pair per person, and reservations will not be allowed by phone, email, or any other means. It snowed this morning. I thought it had all melted by the time I went out walking with a camera, but here's a sprinkling of snow on a tree-fungus. It's just wrong. I am not ready for winter. Not yet. And below is Cabal and some leaves (and Maddy). Many of you have written in to ask why he's not wearing his Go Away Hunters And Do Not Shoot At Me orange cape. It is because he dashed off into the woods the other night after a deer, and returned without it. Probably the deer is now wearing it to bamboozle hunters. I'm madly trying to finish things before I head out to China for a few weeks, to wrap up the research on my Journey to the West project (this trip was meant to have happened in Feb/March, but the one-two good-bad punch of winning the Newbery Medal and my father dying threw the whole planned shape of the year out of whack, and it's not back yet). I finished a short story called "The Thing About Cassandra" and the editors accepted it (hurrah, especially because they were most gracious earlier this year when a story I was writing for them crumbled into dust and ash in my hands before it was done). I'm trying to finish a short story about a cave on the Misty Isle before I leave, and I'll be recording my stuff for my NPR Morning Edition piece. Sxip Shirey is working on the music for my short film soundtrack and every day he sends me bits of music and I play them, and send back a yes, or a no, or a why don't we try this? We harvested the honey on Thursday, and Cat Mihos chronicled it all on her blog (http://kittysneverwear.blogspot.com/2009/10/bees-glorious-bees-title-suggested-by.html) including film footage of me shaking bees off a frame, so I refer you there for photos and an account of our day's Beeing. Strangely my favourite moment was when the bees from the Green hive got upset, and suddenly I found myself crouching by the hive in the middle of a storm of very angry bees... and found myself feeling very peaceful and placid, and didn't move and I let them stop being grumpy, and all was good. (Except for Hans and the Birdchick both being stung on their ankles and through their bee suits). Let's see. Here's an account of the Toledo talk http://toledoblade.com/apps/pbcs.dll/article?AID=/20091006/ART02/910060367, and of the Cleveland talk (http://www.clevescene.com/scene-and-heard/archives/2009/10/05/a-geek-heros-welcome-for-author-gaiman). Both were fun, and started giving me ideas for how to do the CBLDF Reading Tour next year. I know Banned Book Week is over, but since you discussed it on your journal, I hope you won't mind one more question about it. When is it OK to challenge a book? Should a book be challenged at all if it seems inappropriately placed? For example, I read a lot of young adult, and I found myself reading a book that was distasteful to me, as an adult. (I thought the language and sexual incidents were gratuitous to the story, and beyond what I would want a teenager reading.) I pointed this out to the children's librarian, and she said it would be reviewed. Afterward, I panicked a bit. Had I done something wrong, I wondered. Had I just banned a book? In your opinion, is there ever a time to challenge a book's placement? For the record, I still don't believe in outright banning a book from a public library, but now I'm not sure how I feel about challenges to young adult sections. I'm not a librarian or part of the ALA, so you're getting one author's opinion here. At the end of the day, I don't think the problem is the people who want to figure out where books get shelved. It's people who want to remove the books entirely, and would very much like to burn them. It's people stealing books as a way of making sure that other people don't read them. Are some libraries shelving Gaiman’s book in the YA section because of its disturbing opening scene? If so, then that “clearly smacks of self-censorship,” says Pat Scales, president of the Association of Library Services to Children. Scales, who says that although determining what materials belong in the children and young adult section is oftentimes difficult, “Anytime you keep something from its intended audience or make it difficult for them to find, that’s self-censorship.” And that’s against professional ethics. but truthfully, I wouldn't blame any librarian who decided they wanted The Graveyard Book kept in YA. 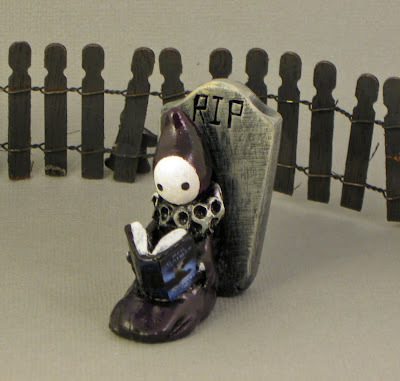 I would get grumpy if confronted with librarians who had decided not to get The Graveyard Book for their libraries, despite the Newbery Medal, because they thought kids should be protected from it. I’m sure you get loads of nice mail from lots of people around the world. How much nasty mail do you get, though, and does it make you feel bad? If it does, how do you deal with that? I’m a beginning author and I just got my first piece of nasty mail, wherein the writer said she had an absolute “hate crush” on me. I consoled myself with cake and wine but the effects were predictably fleeting. a) they're a bit mad. c) it's only the internet. I get well over ten thousand FAQ messages in on this site every year. Most of them don't get posted, because most of them are people saying, in various ways, thank you. Out of that ten thousand there will be a handful, no more than a dozen or so, of weird, poisonous, creepy or crazy ones that come in (from a distinctly smaller number of people than there are email addresses). Most of those get filtered before they reach me. And the ones that make it through normally leave me with a strange, joyous feeling that I must be doing something right if those people don't like me. I'm fascinated by how much more upset they get whenever I get a big award or something good happens. My advice to you would be to do with creepy emails what Kingsley Amis used to say he did with bad reviews: he let them spoil his breakfast, but didn't let them spoil his lunch. Let the effects of the creepy people be fleeting too. And keep writing, and keep doing well, because it really seems to irritate them. Which reminds me, The Graveyard Book was made a Boston Globe-Horn Book Honours book, this year, and you can see video footage of the awards ceremony at http://www.hbook.com/bghb/video09.asp, including my editor Elise Howard reading the actual speech I wrote, and the video I recorded for them just as I went down with the hell-flu of last week. I was sorry to learn that Henry Selick and Laika, the director of and studio who made the Coraline movie, are parting company. They were an unstoppable combination, and I wish both of them extremely well in whatever they do in the future. Why you should dress up as Delirium for Hallowe'en. Was thrilled to see One and a Half books by me on the Australian Favourite Books of All Time list. I just noticed that to celebrate our Year On The Bestseller Lists, over at http://www.mousecircus.com/videotour.aspx, where you can still watch me read ALL of The Graveyard Book for free, new Q&A videos have started appearing. If you head off to http://www.mousecircus.com/videotour.aspx?VideoID=16 you will see lots of me answering questions. It's surprising to me how tired I look in them -- I'd forgotten just how gruelling the schedule was, and now all I remember is how immensely enjoyable it was to read stories to and answer questions from so many people across the USA. it was a this kind of day. In a hotel room in Cleveland. The hotel just sent up a Bic disposable razor, as I had left my many-bladed thing at home, and wanted to shave. For the first 30 seconds of shaving, I thought, ah, why do I use an expensive shaving device rather than one of these? It works just as well. Then I noticed the amount of blood appearing and decided that there was a lot to be said for multi-bladed shaving devices. Also, ow. Anyway, I went to Cleveland yesterday -- set out very early in the morning and got to Cleveland in time for a 2:00 reading/talk and a signing. There's an auditorium in the Cleveland Library (a beautiful building that used to be a Catholic Girl's School) that fits over 650 people. The auditorium was full. So was the overflow room where 350 people watched it on a big TV (I went and said hello to them first, so they knew it was me and not just animatronics). I learned when it was all over that fire marshalls and such got involved, and that people were being turned away (I'm really sorry). Then I did a reading. 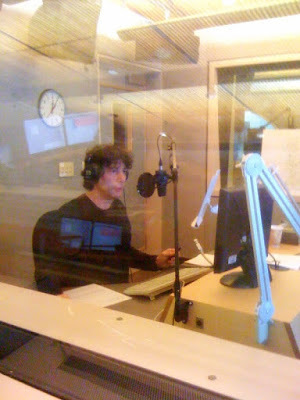 The cold has left my throat missing a chunk of range, but done that nice thing where I get all this bass I don't normally have, so it was easy doing the bear's voice, and harder doing some of the others, and then we did a Q&A and I did another reading and it was all over too quickly. I've been a devoted reader since middle school (I'm now a graduate student, so that's a long time!) I was so excited to find out you were giving a talk in Cleveland, where I started grad school recently. I was so disappointed to show up today, with the Graveyard Book in tow for signing, and be turned away by police officers due to overcrowding at the library. I had been looking forward to this event for a few months now, to finally get the chance to meet you. Will you be returning to the area anytime soon? I'm sorry. I don't think anyone at the library had dreamed that more than a thousand people would show up. I think some of them thought it was a bit optimistic having an overflow room at all. I'm in Toledo tonight, which is sort of in the area, but then it's going to be a while. (Incidentally, people sometimes ask me where they can buy signed stuff from, and I normally say "I don't know" or "Dreamhaven". But there's always the CBLDF Neil Gaiman store. A useful tip for Xmas. Also the only place that you can get the me-related BPAL perfume "imps" (small sampler scents). Hi Neil, love your work and am wondering will you be visiting little old New Zealand any time soon? Would love to hear you speak, I realise you must be super busy and thank you in advance if you have a chance to answer. Yup. In March, although I don't think the event has officially announced it yet. Labels: CBLDF, Cleveland, libraries, Toledo, what happened to the days when I did cute or funny or interesting labels then?